Patea PNG Quilt Collective: March 9. First two quilts from Gina. Ken's cousin David and his wife Yaso came to visit us today before Yaso flys out to PNG tomorrow to meet the tribal leaders of the community she is providing assistance to. She said the elders are already walking to the village where she will be driven to from the airport. It takes them four days to walk through the forest to reach this village, so she always makes sure she never misses the flight that takes her to Port Moresby for the truck that meets her to transport her to the village. I took the opportunity to photograph her with the two quilts I gave her to take with her. One is the cot quilt I posted a photo of here yesterday and the other is a slightly larger quilt that has been on the back of our couch for a couple of years. It was given to me by one of my home care clients who won it in a raffle but didn't like it. So there is no emotional attachment to it for me, and I decided it would be of much better use in a community of people who are living in the forests of PNG on whatever plants they can find. Yaso is in the process of teaching them to keep chickens, harvest water properly to grow small crops, and other basic survival techniques that the rest of the world take for granted. I have asked her to do a brief write up for me to post on a blog along with photos of the conditions under which the natives live and where she works with them. In the meantime, I will continue making small quilts out of my stashs, and will gladly accept any that anyone reading this would care to make. Yaso says to make sure that the quilts have names of the makers on them so the native elders can explain to the women where the quilts come from and who made them. She said it is part of their nature not to just accept any 'charity' without proper ceremony thanking the donors, even if they are not there, and she will photograph each quilt with it's new owner as they are distributed. It would be greatly appreciated if anyone reading this would post a link to it on their blog so word can get around. 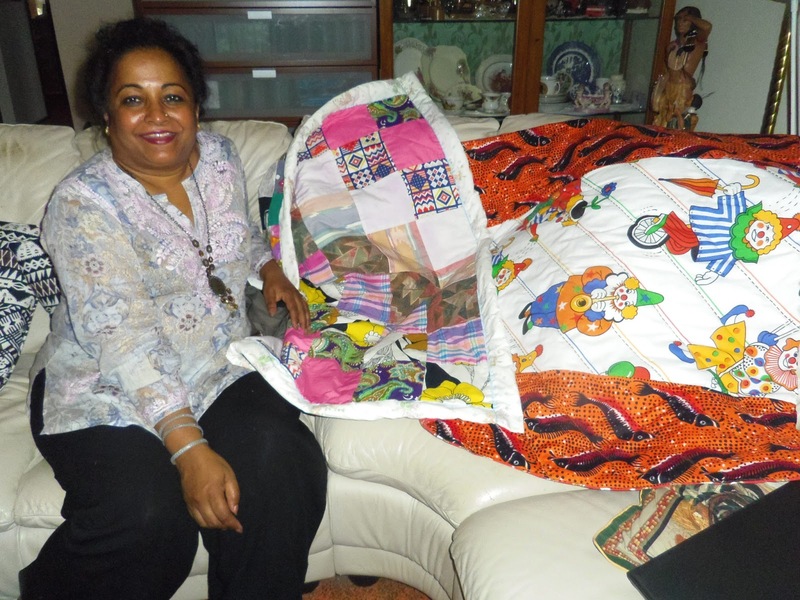 I know there are other bloggers making full size quilts for our Aussie servicemen, and of course Jan Mac of Oz Comfort Quilts has been distributing quilts to disaster victims for years now. But my request might be easier to work with for those people like me who don't feel able to make a full size quilt for any number of reasons, but a little cot quilt is just a fun thing taking a couple of hours, and using up some of those scraps that all fabric collectors have!